Leona the Bloodthirster, in a rare old photograph. 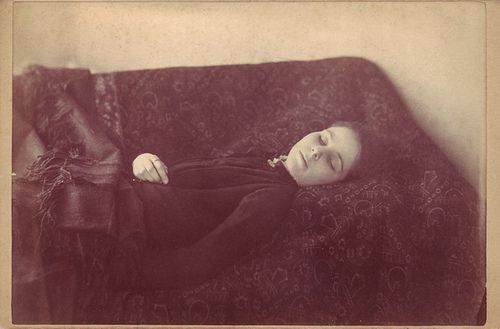 She died in 1909 supposedly from drinking her own blood. I posted this picture earlier today and another blogger, http://livelovelaughdotme2.com/ sent me to the website http://www.poetrycritical.net/read/65725/ where I found this prose – the history of her. I didn’t know it. I was just captivated by the picture and the possible story that might be there. The website at the bottom may be where it originated. Since they ruled it a suicide..there must have been a suicide note..right? I don’t see one. You are probably right. Is more gruesome that way and people are going to believe what they want to believe. Weirdly. This post has had more his than any other post I put up in the last 1 1/2 years and it comes from Google type searches from all over the world. I originally put it up as a fluke but people search out this story. Thank you for the info. I had never heard of her before. I amended the post and gave you credit and reshared it with my sm. You had made another comment about the “Christians” in the prose that I answered and then your comment and my reply disappeared! Maybe she reached out from death and snatched it away! EEEEEE! Heebie Jeebie alert! Tried to find more about her but no luck. The autopsy report says she died from drinking large quantity of her blood. Shouldn’t there be a report of her injuries received from the mob who pulled her from her home and beat her nearly to death? I’m not surprised there isn’t given the year. Records get burned and lost. I wonder what a “large quantity” is, and what is about blood that would have killed her? Maybe it’s the loss of blood? Sounds pretty logical to me! maybe she was draining it and drinking it at the same time! Yes, Since she was beaten, maybe she was dying so she went ahead and did this? It’s possible . . .